Often heard questions from Ohio farmers these days include “Who is this solar developer?” and “Is a solar land lease agreement good for my farm?” Well, if you could lease your farmland for $1,200 per acre over 30 years, would you do it? Considering the USDA 2016 National Agricultural Statistics Survey values Ohio cash rent at $160 per acre, this may seem like a rhetorical question. And while on the surface this may seem like a perfectly logical, economic decision, it is important to carefully consider all of the impacts of converting farmland to solar energy production. As part of an agreement with the Public Utilities Commission of Ohio, AEP Ohio recently committed to developing 400 megawatts of solar in Ohio. In December of 2016, AEP Ohio issued a request for proposals (RFP) to develop up to 100 megawatts of solar energy. 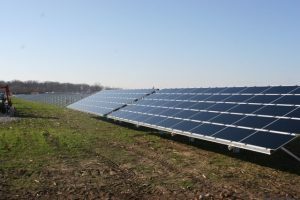 In response to the recent RFP, solar developers and representatives from land acquisition firms are contacting farmers and landowners throughout Ohio to secure long-term land lease agreements to site a large utility scale solar farm. Solar leases are complex long-term commitments with various social, financial, and legal implications. One of the most important components of utility scale solar energy development is the contract between the landowner and the developer, providing site access to the developer. This is often referred to as the solar land lease. Utility scale solar energy leases are long-term agreements which often range from 20 to 30 years or more. It is crucial that landowners fully understand the details of the agreements to ensure they are adequately compensated and their property rights are protected. When considering a utility scale solar land lease agreement, do not fall victim to making a rushed decision. Many times, the initial lease is written in favor of the developer to best achieve their long-term interest, flexibility and objectives. Do your homework, conduct a detailed assessment of the developer, the overall project, and seek advice from your tax and legal professionals before signing any paperwork. While every project and lease is unique, below is a list of common issues to consider prior to signing a solar land lease agreement for your farm. How will a solar lease agreement influence my property taxes? Are there pre-existing deed restrictions on my farm? Will a solar project impact my eligibility for Current Agricultural Use Value (CAUV)? How does a solar land lease impact my property rights? How will a solar project impact the surface water on my farm? How is the project decommissioned after the lease expires? Who is responsible for insurance and liability for the solar project located on my property? What are the per acre lease rates for utility scale solar projects? Who will maintain the land? Is a utility scale solar project subject to the public utility tangible personal property tax? This blog article has introduced a few of the many of issues to consider before entering into a utility scale solar lease agreement. Landowners approached by a developer to lease their land should carefully consider the legal and tax issues associated with the agreement. Furthermore, landowners are encouraged to work with an attorney that is familiar with energy land leases agreements to negotiate terms representing the landowners long-term interest. Eric Romich is an Assistant Professor and Extension Field Specialist for Energy Development. Please find the answer to the question from the comment below here. Posted in Energy	Tagged Solar Energy, solar farm land lease agreements	Bookmark the permalink. Does anyone out there know what the income rate per acre is for central Pa ? We got approached by Cyprish Creek Renewable. Bill, it can depend on a number of property specific factors. For example, distance to 3-phase power, distance to a substation, topography, electric service territory, etc. In general, $700-$900/acre is a good starting range. How many acres are you considering leasing? Jane, thanks for the information, it’s very informative. Can you explain how the multiplier works? Also is there a normal time and payment value for due diligence. Is the payment per acre, or flat fee? Thanks for sharing. I recently came across several ads for solar companies seeking landowners who might be willing to lease their land for solar farm development. Why do these companies not just purchase the land outright? Over the course of 20-30 years, wouldn’t ownership ultimately save them money? I have wondered about this same thing. Not that I’m willing to sell. Maybe the solar company has too much work to do to get county approval, to just, out and out buy up front. It took them 3.5 years before they exercised their option with my land. I own a farm in southwest Colorado, approximately 290 full sun days annually. I also have a transmitting line line running through the property. I am doing a feasibility study to lease this property long term to a reputable company. Any ideas where I should start my search. Thank you for the answer. My land that is under consideration for lease is in Oregon. I have one parcel in option for 1200 per acre, per annum, with a 3.5% multiplier and they told me this was the strongest multiplier they have done. I have a second parcel in consideration with a different company and they do not want to commit to more than a 2% multiplier. I think the 1200 is pretty good but the multiplier is low. I never thought of comparing this rate to the rate of farmland rented for other purposes. I think there has to be a different consideration for farm land leased for solar versus farmland leased for crops. Crops come and go in a year. Not so with a long term solar lease. I think my option will bring in a higher than average rent for a solar farm but it came with a price. It was a 51 acre parcel but only 31 acres will be utilized. I may not have any options for the left over 20. Can you share the company you are working with? The contract was sold by Coronal to GCL Energy. I live in Pennsylvania and have been approached by Coronal Energy in regards to leasing some of our ground. They are offering $850 with a 1.5% multiplier. This seems low compared to what I have been reading here, however an extension agent I spoke to said it was higher than he expected. Solar farming in somewhat new in PA. We own a 60 acre farm that is 85 -90% tillable. Your thoughts on this would be appreciated. We have 25 acres in Chester County and were just contacted by Solamerica about a potential lease. We would be very reluctant to “handcuff” my heirs and lock up our land for anything less than around $3,000 per acre per month or about $60,000 per year. (Assuming that we would allow them to develop 20/25 acres.) Now we’re talking $1.8 million. If you need the money, that is one thing, but if you don’t, it becomes more complex. We live on a major highway and are bordered by a golf course on one of four sides. We can sub-divide the 20 acres into four parcels and develop it if I want, so their lease offer is unlikely to be attractive to us. Taking the lease also prevents us from selling the property as a farm. Lots to think about. Hi Jane – my father lives in southern Oregon and has been negotiating with a solar company to lease his farmland. Is there a chance he could contact you? My name is Carol Milton. I have 630 acres in Kansas and I’ve been contacted by a solar farm to sue it for up to, $1200 per acre. Are you having any luck with what you are doing? How do you know what company to trust? I make less than $30,000 per year. They graze my pasture, I have CRP land and they do some crops. SO I’m looking to do something with my land and not sell it for the $1,000 an acre I was offered by a family farmer. Thanks for your time and I hope your venture is going well. My name is John. I buy ground across the U.S. as well as look at the prospect of solar power projects. Are you under contract for the land for CRP? If so, how long do you have left? Do you have an address where I can look into the farm further. I was just presented with a contract and would like to consult you if you know prices in Texas. Hey, do any of you know of any companies offering to lease land in Nebraska? Hi Carol, to sue it? What is that? My adventure began with a company in N Carolina which got sold to another company, which got sold to a Chinese company. They are building now. I did not want China on my ground. Love the people, hate the dictatorship. It feels really weird to have China leasing my property. But the money is coming. I was very hard nosed about the amount per acre and the multiplier. I got it, but, the solar company negotiated with my neighbor and now the bulk of the solar farm will be on his land, and not mine. I would have preferred it the other way around. These companies do not always know up front, which acres they will want to use. That can change on you. It did with me. Pigs grow fat, Hogs get slaughtered. I googled the companies that were interested and decided by their websites if they were reputable. I sure wish America was on my land, and not China. But the Chinese are the leaders in solar, it seems. It was the American company that sold their contract to a Chinese company. I had nothing to do with it. What’s the name of the NC company that sold to China? My father in law is about to sign a lease in N.C. for 800 an acre with a multiplyer of 1.5. Seems a little low considering solar companies can make up to 42k per acre annually in profit. 30 year agreement with tenant option to extend for two consecutive 5 year terms is outrageous in my opinion. What about a multiplier? 1200 an acre today sounds like a lot of money but in 20 years it’s worth a lot less. What is the average rate for the multiplier? Hat should a land owner ask for? Thank you for your questions, Jane. Because the answers are not simple enough to put in this comment box, Eric has provided an explanation in a pdf document at the end of the above article (below his name). Hope this helps!